The Parker Ridge Condominiums complex, including eight duplex homes and twenty-three townhouses, is located on a ridge overlooking the Merrimac River. The townhouse units are laid out along the knoll so as to provide views of the river and a small wooded area on the northern slope of the knoll. 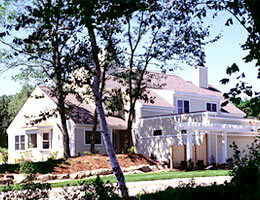 Parker Ridge was the first "cluster zoned" development in Newburyport. The project leaves large areas of meadow and woods open for common enjoyment by grouping the buildings tightly together. Landscaping was designed to leave as much of the surrounding natural environment as possible undisturbed. Woodman Associates custom designed certain features for the owners of several units; in addition to providing the customary architectural services for the developer. Such features included interior layouts, special decks, and fencing.